We've been searching, finding and recommending the best camping and glamping sites for over a decade now. And, whether you're a guidebook reader or a website browser, it's people like you that keep our camping community alive! What's more, we love to reward our customers and encourage even more holidays every year. So, every single month, we'll be opening up the Cool Camping treasure chest and drawing a prize winner from all of our customers in the previous month. The winner will be sent £50 of Cool Camping Gift Vouchers to spend on a camping or glamping holiday of their choice. It couldn't be simpler: Book your holiday on coolcamping.com this month and you'll instantly be entered into our prize draw. Every single month we'll draw a new customer to win the prize, who'll enjoy £50 to put towards another camping or glamping holiday of their choosing. Nice! 1. This promotion is open to UK residents, excluding employees of Tripadee Ltd, their families, agencies and anyone else directly connected with the promotion. 3. Competition Details: In order to qualify for this competition, entrants must book a camping or glamping holiday using the booking system on the coolcamping.com website only. Bookings made using the Cool Camping system on any other websites, including independent campsite websites, will not be eligible. All eligible entrants will be automatically entered. 3.1 Bookings that are later cancelled will not be eligible. 3.2 You may enter as many times as you wish; each separate booking made via coolcamping.com will be counted as a separate entry. 3.3 The number of people included in the booking or the monetary value of the booking has no impact on entries. 3.4 We accept no responsibility for damage or loss resulting from misdirected or incomplete entries arising from computer malfunction, viruses, bugs or telephone malfunction or other such causes. We are in no way liable for the reproduction or indirect access via third party websites which misstates or omits any of the information or terms and conditions connected with the promotion. 3.5 The winning booking will be selected in the first week of each month. The winning booking will be selected at random from all eligible bookings placed within the preceding month (prize draws to commence 1st December 2018 for bookings placed in November 2018). 3.6 The winner will be notified via email within 15 days. The name of the winner may be published on the coolcamping.com website, and may be used marketing emails and on Cool Camping's social media pages. 3.7 If the winner fails to accept their prize within 7 days (via confirmation e-mail), they will be withdrawn from the competition and a new winner will be drawn. 3.8 This competition closes on 1st April 2019. 4. 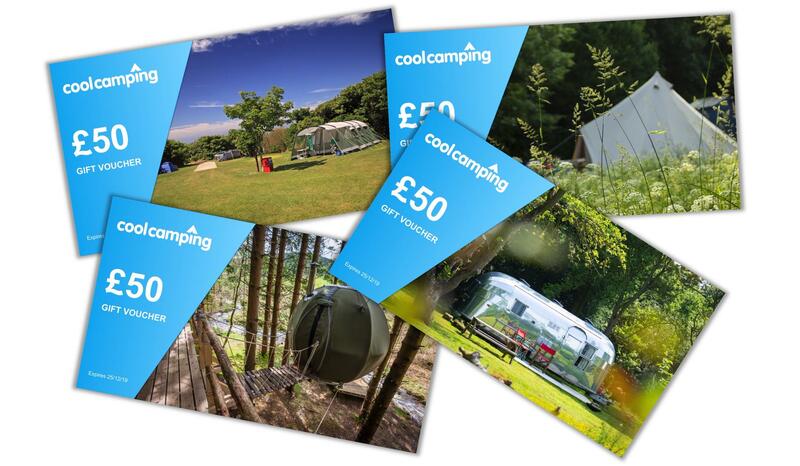 Prize Details: Prize consists of a £50 Cool Camping Gift Voucher. Full Gift Voucher terms and conditions can be found here. 4.1 No cash alternative will be offered. 4.2 In the event of unforeseen circumstances, the competition promoters reserve the right to offer an alternative prize of equal or greater value should the specified prize become unavailable. 4.3 The promoters reserve the right to cancel or amend without notice the terms of this promotion and any prize issued in the event of major catastrophe, war, earthquake or any actual or anticipated or alleged breach of any applicable law or regulation or any other circumstance beyond the promoter’s control. 4.4 The promoters cannot be held liable for any failure by third parties to fulfil their obligations or for any acts or omissions outside their control. However, the promoters will endeavour to minimise the effect of any such failure. 5. By entering this promotion all participants will be deemed to have accepted and be bound by the rules. All entry instructions form part of the rules. Any breach of these Terms & Conditions will result in a forfeit of the prize. This competition is promoted by Tripadee Ltd, 81 Rivington Street, London EC2A 3AY. Entries should not be sent to this address.